Dry rot is one of those problems that just won’t go away, even if you ignore it. We call it the “silent killer of wood” because it quietly works around the clock, eating away at the wood on your home. Do you know what causes dry rot and why it is such a problem? This article will give you the information you need and you’ll learn eight tips to help you prevent dry rot. How big of a problem is dryrot? When you consider the fact that one out of every ten trees cut down will be used to repair dry rot damage, one can easily argue that dry rot causes more damage than do termites. 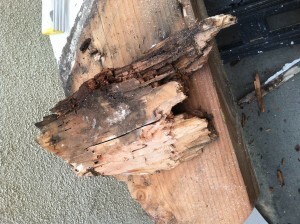 Dry rot is caused by wood-destroying (decay) fungi. These decay fungi are plants that live on dead trees and lumber products. These plants are rather sophisticated and can grow very rapidly when conditions are right. When a piece of wood has been infected by decay fungi, it is common to see small white/light grey fruiting bodies growing out of the wood and they look something like a “fan shaped sheet” or a “toad stool”. These fruiting bodies produce many microscopic spores which are similar in function to seeds from higher plants. These spores are dispersed by wind or air currents and when one of them lands on a piece of wood in favorable conditions, it will germinate and grow quickly. Decay fungi must have air, moisture and wood in order to flourish. Moisture is the most critical factor. Cellulose and lignin, which makes up the cell walls of wood, serves as the food source. When decay fungi attacks a piece of wood and starts digesting it, the wood shrivels up fast and becomes spongy (very weak). In areas where the decay hazard is high, it is best to use the heartwood of a decay-resistant species. Redwood and western red cedar are good choices. You may also want to have the wood treated with a good preservative, such as Bora-Care or Timbor. When building a new home, always make sure your site is “well-drained”. You do not want water seeping under the house. Larger roof overhangs, rain gutters and downspouts can be very effective. Also, remember that you should never place untreated wood within 18 inches of the ground. On homes with a raised foundation, make sure you have adequate cross ventilation. A good rule of thumb is to provide two square feet of opening for 25 feet of wall. Keep vegetation cut back away from subarea vents so they won’t restrict air flow. In areas where you have soil with a high moisture content, install a moisture barrier on the soil surface. This will cause the moisture to condense on the bottom of the plastic barrier and return to the soil instead of condensing on the floor and structural members of your home. Don’t mount wood directly on concrete unless you are using treated wood. On items like patio or porch post, it is a very good idea to use metal or plastic spacers to keep wood up and off the concrete. This will help prevent the wood from “wicking up” water from rain or lawn sprinklers. Control moisture. If you have plumbing leaks, roof leaks, sprinklers spraying against the house or any other situation where wood is getting wet, have it fixed as soon as possible. Repair or replace damaged wood because all of those cavities or holes caused by termites are easy places for moisture to collect and start dry rot. Seal exterior wood with caulk and paint. This will help to keep moisture out. When doing repairs, always try and control the moisture source, first. If you don’t, the problem will simply continue. Minor dry rot damage can often be carved out, treated with a registered fungicide and then repaired with a quality wood filler, such as “Bondo”. Wood members which are heavily damaged should be cut out and replaced. You should always cut out damage at least one foot beyond the rotted areas. Some make the mistake of placing another piece of wood right along side of a dry rotted member so they can “brace it up”. Don’t do this because the dry rot will quickly attack the new wood. The only exception to this rule is when you are working in an area where you can completely eliminate all moisture, such as in a wall or under a house. Remember that dry rot is like cancer and it will quickly spread unless you can completely eliminate all of it. Have a problem with dry rot damage on your home or business and need help in repairing it? 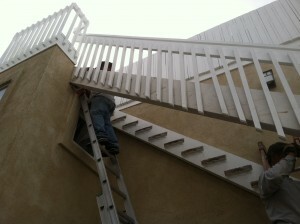 We have some of the finest carpenters in Orange County and they will be happy to assist. Call our office staff at (949) 631-7348 and we’ll schedule an appointment at your convenience.